ANISSA AIDA is the brainchild of designer Anissa Meddeb, a graduate of New York’s Parsons School of Design. It’s minimalist ready to wear label launched in 2016. melding together different cultures, as well as influences of the past and present. “Anissa Meddeb’s sleek sophisticated designs draw on cultural and sartorial influences from her own Tunisian heritage, blending them with those of Japan, China and the Far East” (Evening Standard, September 20161. It puts a modern spin on ancestral garments such as the kimono and caftan. The collections meet halfway between East and West, tradition and modernity. The chosen fabrics express and foster cultural exchange from English oxford, Italian linen and Tunisian denim and hand-woven silks, such are all visual dialogues creating the designer’s unique perception of history. 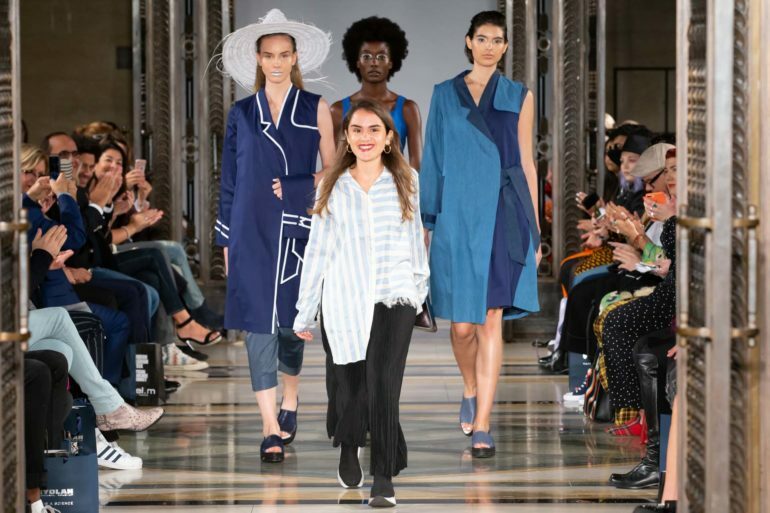 In September 2016, ANISSA AIDA has received the sought after SS17 Fashion Scout ‘Ones to Watch’ award, offering a sponsorship for her debut catwalk during London Fashion Week. The label has been named by Forbes as their “favourite this season because she makes ready-to-wear classics with clean lines that would suit everyone”. More recently, in January 2018, she was selected for the highly selective FIT Design Entrepreneurs program at the Fashion Institute of Technology in New York and won the OpenMyMed Prize of Maison Mode Med iterranee with designer Simon Jacquemus as one of the prestigious judges. For 5519, Outre-mer collection ANISSA AIDA is in line with the previous collections, through the use of stripes and a colour palette composed of shades of blue and white inspired by Mediterranean villages. It is also bringing some newness with the introduction of patchworks. “Japanese Boro textiles and their patchwork aesthetic, as well as waste reducing tradition inspired this collection. A combination of Tunisian and Japanese cultures influenced the young Tunisian-born designer”. (WWD, February 2018). The label’s mission is to preserve cultural heritage by re-interpreting local ancestral techniques. Conscious about the impact the Fashion industry has on the environment, ANISSA AIDA values sustainable sourcing, collaborations with artisans and ethical employment practices during production. ANISSA AIDA will showcase her SS19 collection at Fashion Scout London, in the Presentation Studio on Friday 14th September 2018 at 11.30 during London Fashion Week.